Financial security is top-of-mind for most Americans, especially those nearing or in retirement. Not having to worry about day-to-day finances can relieve a tremendous burden. At the same time, wondering if you will outlast your money can allow anxiety to dominate each and every day. With that in mind, it makes sense—at any age—to get the complete financial picture so that your spending and saving ensures a worry-free retirement. There’s no shortage of online financial planning tools to help you reach your goals, and we’ve picked out some of the best. Even if you’ve been a diligent financial planner your entire life, these financial planning tools can eliminate hours of tedious pen-and-paper work and offer real-time insights into your checking, savings, even investment accounts. If you’re serious about securing your financial future, take a few moments to read what these tools can do for your peace of mind. The AARP Retirement Calculator is a great starting point for assessing your financial situation. It answers basic questions like “Am I saving enough?” and “How long will my money last?” In just three quick steps, you can get a sense of your financial framework moving forward. The calculator doesn’t offer ongoing, real-time advice, but it’s a good check-up to help figure out which day-to-day online financial planning tool may be right for you. The Social Security Retirement Estimator, an official financial planning tool from the U.S. Social Security Administration, can provide an estimate of your Social Security benefits based on past Social Security earnings. Because of likely income changes for younger Americans, this tool has limited applicability for those in their twenties or thirties. But if you’re nearing the point of applying for benefits, the estimator can help you find out what you can expect. As the estimator notes, Social Security funding will drop to $0.77 on the dollar by 2033 based on current payroll tax collections. FlexScore is about simplicity. Rather than burdening you with an array of numbers, scores, or grades, FlexScore offers a single metric, grading your total financial security from 1 to 1000. The free service also offers ways to improve your score, providing motivation to update your life insurance policy or rebalance your portfolio. 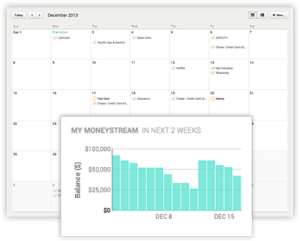 Mint is perhaps the best-known tool for monthly budgeting and financial management. The free service, which is funded by targeted advertisements based on your financial spending habits, aggregates information from all your financial accounts, from checking and savings, to investments, to credit card and mortgage debt. You can set budgets and even get alerts when you’re approaching self-set monthly spend limits or when account balances are low. 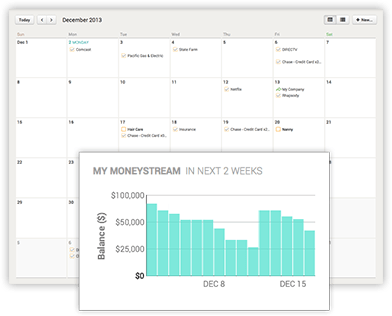 Like Mint, Buxfer gives users a way manage monthly income and expenses. You can even sign up with an existing Google or Facebook account. You’ll be able to track and budget regular expenses and also plan for larger ones, like vacations. If your friends and family also use Buxfer, you can transfer money directly for shared meal expenses or other repayments without having to make a trip to the bank or ATM. MoneyStream combines the benefits of bill-paying tools with budgeting tools. In addition to providing an overview of your financial picture, MoneyStream uses past information to project available cash in the future. It also adds bill-pay dates to your calendar, making it easy to keep track of payments for your cellular phone or natural gas. Credit Karma, as the name implies, is a personal financial management tool focused on your credit score. While it provides an overview of your general financial picture, with information on an array of accounts, it highlights truly free credit scores, reports, and alerts to help you monitor your credit. It also offers credit forecasting to predict how a future action may impact your credit score. Developed by an economics professor at Boston University, ESPlannerBASIC is a no-frills financial planning tool that offers in-depth information on the state of your personal finances. Get suggestions on how much you should spend, save, and insure every year through retirement to enjoy a stable standard of living—without borrowing money. You can use ESPlannerBASIC to help determine when you should retire, file for Social Security benefits, or downsize from your current home. Covester provides a new twist on managing your investment resources. The site recruits a pool of highly qualified portfolio managers. Then, based on your investment goals, it pairs you with a portfolio manager and mirrors trades made by that manager for your own account. 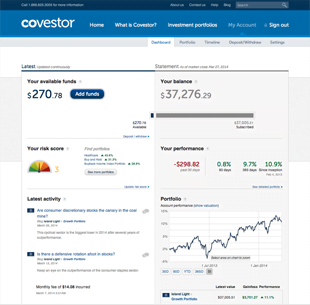 Promising complete transparency, Covester offers the full record of trades by each manager, who invests his or her own money in every portfolio. By giving investors access to new talent in the investment world, Covester provides your portfolio the possibility of latching on to a potential star—without stratospheric fees. Betterment offers users the opportunity to upend traditional investing models. The investment service relies on automated investing to provide clients with low-cost exchange-traded funds (ETFs) that avoid many of the associated fees of traditional investing. After providing information about yourself, your income, and investment goals, Betterment recommends a diversified portfolio of ETFs that it independently rebalances throughout the year. It even sells off any end-of-year losses to offset the tax burden on capital gains. FutureAdvisor provides automated investment management solutions, focusing on ETFs with no commission fees and broad diversification. Automatic rebalancing provides peace of mind that your money is being constantly monitored for ways to lower risk and grow returns. 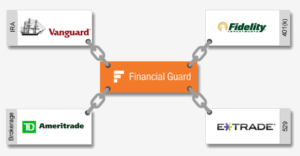 Similar to online financial planning tools like Mint or Buxfer but with a narrower focus on your investments, Financial Guard lets you link your various portfolios and monitor them from a single online platform. Financial Guard assesses each of your investments to offer an overall performance grade as well as recommendations to improve the grade. The service does not require you to move your investments. 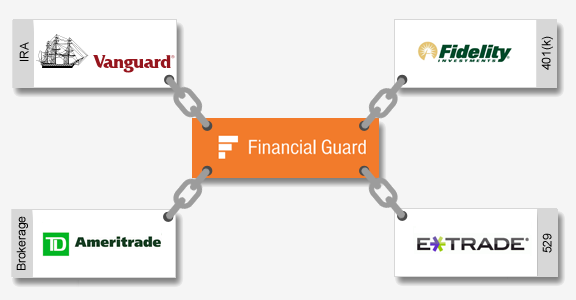 Guide Financial is unique in that it is available only through financial advisors, not to independent consumers. That said, it provides a platform for clients of financial advisors to visualize their entire financial picture, from getting alerts about reinvesting unexpected income to measuring the impact of monthly contributions over time. If you’re looking to marry online tools with professional, in-person advice, you may want to seek an institution that relies on Guide Financial for integration between man and machine. My Virtual StrongBox bills itself as the digital answer to safe deposit boxes. In short, it provides customers with a secure cloud-based solution for sensitive and important documents, be they medical records, wills, tax information, or other financial data. Rather than relying on outdated paper copies or trusting the limited security of standard cloud services, My Virtual StrongBox provides a convenient and safe solution to help with online financial planning. While some of these online financial planning tools are for independent review and action, others collaborate with financial planners. And you may still want some person-to-person advice, especially at the outset of planning efforts or if you’ve recently undergone a major change in your financial picture. The Financial Planning Association is an excellent online resource to help find qualified individuals to lead you toward your financial goals. Of course, with every additional venture into the digital sphere, there are always concerns about security. If you’ve spent most of your life balancing your checkbook by hand or stopping by the bank to obtain your account balance, the idea of sending information about your accounts to various online planning tools can be intimidating. There are near-daily news stories of account hacks and data comprises, and that’s why, with each of these tools, extensive digital security measures are prominently advertised. It’s also worth noting that most of these tools access your accounts on a read-only basis—no money can be withdrawn or transferred from your accounts, but summary data of your financial situation is visible. That said, the immense benefits of real-time data and forecasting offered by these powerful tools can add sought-after security and simplicity to your financial planning. Once you find the right tool, you may never know how you lived without it.